"…likely god’s favorite breakfast food…"
Popovers are indeed the perfect combination of crispy and eggy-gooey textures. Their transformation from a placid yellow liquid batter to a golden, drunken minaret is a joy to the eyes. Plus, they are finger food! Axel’s in Mendota brings a neverending stream of them to your table – and then gives you a bag of what’s left in the basket, when you leave. Sadly, that’s all that’s memorable to me, of the food there, and while popovers make a great breakfast, for dinner we usually need more than bread. So, home cooking was in the cards, for last night. These made for a most excellent starchy side, to the grilled chicken-and-red-pepper on the menu. I’d never made popovers before, but yesterday I got a craving for them, so I dug up & printed a Cooking Light recipe for them online, before heading home. 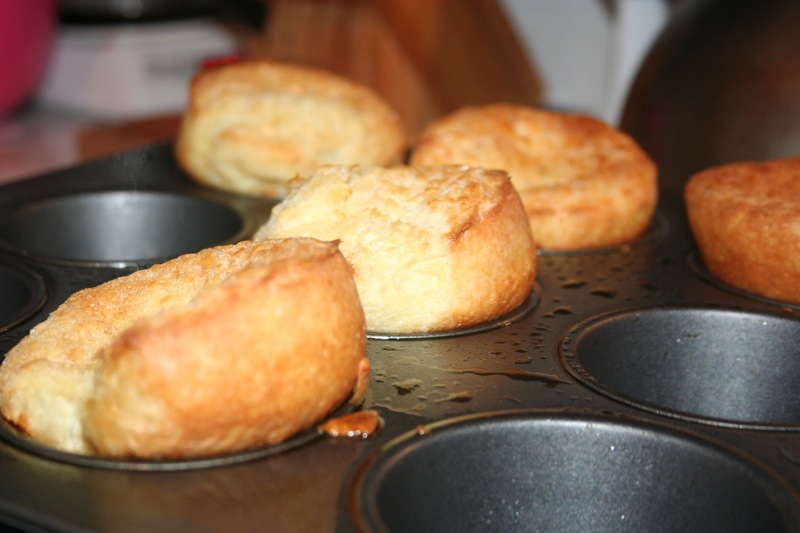 The one type of baking pan I don’t own is a popover pan, but the muffin tin subbed in quite valiantly. They turned out pretty impressively. Per the recipe’s advice, I did not open the oven door to peek -but I swear they were taller, about 25 minutes into it, so I was a tiny bit disappointed at what I saw at 40 minutes. I suppose that was just part of the show -or maybe I need to clean my oven window. I ate two last night, and one today. Steve’s consumed at least four by now. Humorously, one of the reader comments on the recipe was that the results were too bland. This is reliably true for many CL recipes, but it’s a ridiculous comment for popovers. That’s what fig jam is for! Or jalapeno jelly! Thanks, Mark, for the quote, above. So true- and you’re in the land of the brioche!! popovers are glorious, indeed. the jalapeno jelly idea is a good one! i have a couple jars of it so far and am running out of ways to use it! Just found your blog from a comment on Julie’s. I saw you at the Loppet and at Afton; see you at Nerstrand! Hi Steve! I saw you there as well, but wasn’t sure if you’d remembered me. I figured that an introduction at a mile-12 and mile-27 aid station may not end up a crystal-clear memory, for the runner. I pointed you out to my cheering section (“see that superhuman over there? I think he dislocated his hip at the Afton race”).I have a pretty good history of choosing sports that beat me up and tire me out- but even so, I feel puny next to you ultra runners. Way to go! See you at Nerstrand!